A group living along Nelson’s Maitai River want stricter forestry controls saying it is damaging the river. Katy Jones reports. Tom Kennedy has lived along the Maitai River for 30 years and says the river has changed considerably in that time. The retired Tasman District Council hydrologist said sediment was harming the river’s ecology, and had led to a decline in insect and fish species. He is one of a group of residents who say there’s been a lack of action to try to tackle the problem. 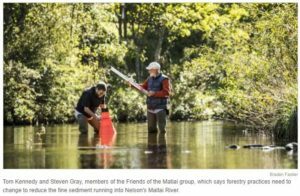 “We’ve struck a block in getting any positive changes to forestry practices which is the real source of sediment in the river,” Kennedy said on behalf of the Friends of the Maitai group. NIWA research carried out for Nelson City Council showed much of the fine sediment in the river came from pine forests, he said. The council wouldn’t release the report to Stuff, saying it was part of wider research on freshwater, that would be made available when complete. But Kennedy, who had seen the report during a council talk to forestry, said it showed a “similar sort of story” to a parallel report, carried out by NIWA for Tasman District Council. The research for Tasman district showed almost 90 per cent of the environmentally-damaging fine sediment at the mouth of the Moutere River came from pine forest. It also showed that recently harvested pine forests, along with bank erosio,n were responsible for a high proportion of sediment in the Waimea Inlet. Kennedy said other research backed up the group’s view there would be no significant improvement in water quality until forestry companies reduced the sediment coming off harvested areas. A study published last year linked run-off from pine plantations in the Maitai river with more blue-green algae cover, also known as cyanobacteria. It found sediment buildup often included phosphorous, which is what the blue-green algae needed to flourish. One of the report’s authors Dr Joanne Clapcott from the Cawthron Institute said an increase in fine sediment downstream of the Maitai meant the river’s flora and fauna habitat was being smothered, and some species had diminished. The research didn’t conclude that forestry practices were causing more blue-green algae, but that “an increase in forestry upstream is correlated to an increase in sediment downstream”, Dr Clapcott said. Friends of the Maitai suggested smaller areas of forest along the river be harvested at any one time, the size of strips of permanent vegetation be widened between the river and plantations, and that different species of trees be introduced for harvesting. The group had met with forestry companies, as well as Ngāti Koata, which owns some of the forestry land. But the changes wouldn’t realistically happen without action from the council, Kennedy maintained. When asked by Stuff if it was monitoring forestry operations along the Maitai River, Nelson City Council said its own forests were managed by the company PF Olsen, whose operations were monitored by the council’s compliance team. The company had been complying with the Nelson Resource Management Plan, although the rules would be superseded by the National Environmental Standards for Plantation Forestry which come into effect next month, spokesperson Clare Barton said. Friends of the Maitai said the new national standards were a step in the right direction, but only covered major rivers and streams. “Considering all of the tributaries and smaller order streams that feed into the Maitai, those are not covered at all, so it’s a major gap in the regulation and that’s where most of the fine sediment comes from,” member, Steven Gray said. Tasman Pine Forests is understood to manage much of the plantation forestry land in the Maitai catchment. The company was approached by Stuff but said it was unavailable to comment at this time.